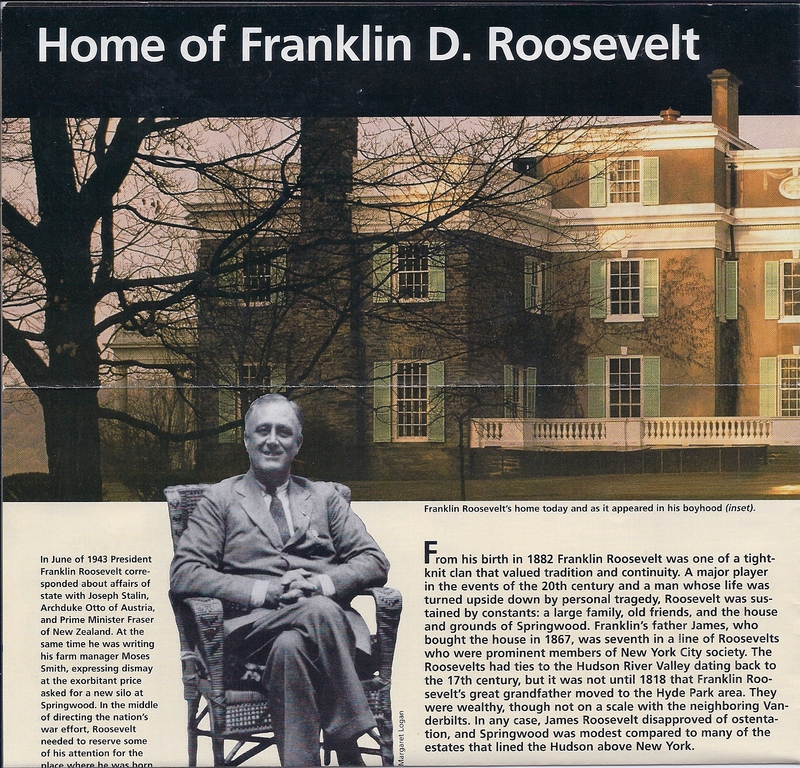 National Park Service Brochure chock full of great information on FDR & Springwood. Welcome to Travel Talk and installment number five of Primarily Presidential Destinations. In the previous blogs of this series I discussed destinations related to modern presidents like LBJ, George H.W. Bush and Ronald Reagan. Now, we’ll step back in time a little bit and for the next two weeks we’ll visit with FDR, beginning with Springwood, his birthplace and life-long home. Beginning in the 17th Century family estates developed along the Albany Post Road, now Highway 9, which runs parallel to the Hudson River. During the late nineteenth century, robber barons made their fortunes on Wall Street down in New York City, while their families luxuriated in opulent Hudson River Valley mansions. As the properties and homes had passed from one family to the next they’d grown from rustic farms to Beaux Art Palaces of the Gilded Age. In 1895, Frederick and Louise Vanderbilt purchased an estate with a rich history and beautiful gardens. The Vanderbilts admired the many decades of development which had gone into their new estate and hoped only to enhance the site with its already beautiful gardens. The result is the Vanderbilt Mansion. Just up the road, Ruth Livingston Mills, inherited a 25 room Greek Revival home, called Staatsburgh, from her parents, and in 1895, along with her husband, Ogden Mills, a noted financier and philanthropist, transformed the already stately home into a 65 room mansion with 14 bathrooms. Franklin Delano Roosevelt was born there in 1882. Hyde Park was the center of FDR’s world until he was seven, and what an elegant world it was. In 1905, he married Eleanor and brought her to his Hyde Park estate. Eleanor’s place in the family is easy to imagine, because when FDR undertook a final major enlargement and remodeling of the home, which his parents had lovingly developed over the years, his partner in the effort was his mother Sara, not his wife. Springwood is everything you would expect of a mansion from the Gilded Age. I could wax eloquent for paragraph after paragraph extolling it’s beauties. For a while it was literally the center of the world, so much so that Roosevelt bought some property several miles from Springwood and built Top Cottage as his retreat. Elizabeth too, needed a place of her own and Val-kill, also a few miles from Springwood, would become hers. When you go to Hyde Park, as you should, don’t make the mistake I did. I read the websites and ordered brochures which promised I’d only need an hour or two here, perhaps an hour some place else and another hour over there. Adding it all up, I thought I’d be able to see all these magnificent homes in a day. That was a optimistic to say the least. You might be able to breeze through these Hyde Park properties in a day, but you wouldn’t absorb anything. I’d planned to take in the FDR properties in the morning and get to Staatsburgh and the Vanderbilt Mansion in the afternoon. We spent the morning at the FDR Presidential Library and the afternoon at Springwood, but even at that we rushed through faster than we wanted to. FDR’s story has too many threads to comprehend with merely a cursory glance. My greatest miscalculation was the time it would take to see the FDR Library and Museum. Having been to LBJ’s library, I figured FDR’s would be a lot to take in, but I hadn’t really understood the magnitude of FDR’s legacy. He actually planned the Library himself towards the end of his second term and used a study in it as his office during his subsequent terms, the only sitting president to so use a presidential library. As you wander through the museum you will not believe how much of American history belongs to FDR. So, plan on spending several days in the area. On the night before we visited the FDR properties, we stayed in a quaint bed and breakfast inn in Highland, NY, not far away from Hyde Park. We arrived at Stonegate early in the afternoon and inquired how we should spend our time, since we would be celebrating our tenth wedding anniversary that evening. The hosts, Neil & Jan Thomas (who by the way are still there) recommended Mohonk Mountain House and it was a delightful experience. We enjoyed the grounds, hiked up to a peak, practiced our putting and rocked on the porch before having a memorable dinner. Stonegate is a lovely property with period antiques and huge private rooms. I can easily say that the breakfast we had there was not only one of the most delicious we’ve enjoyed at any bed and breakfast inn, it was also one of the most congenial. As anxious as we were to get to Hyde Park we lingered at the table and then went on a tour of the gardens. After our FDR experience, we wolfed down a delicious meal at the Eveready Diner and headed up to the Adirondacks – an adventure I’ll share some other time. What you need to know is that when you’re in Hyde Park, you’re only a couple of hours from New York City, the Catskills are just across the Hudson River and the Hudson River Valley itself boasts more lovely homes to tour, important connections to American Art and more history than you can shake a stick at. Like the area surrounding the LBJ destinations, you could easily fill up two weeks in the Hyde Park environs. The scenery alone is worth the trip. 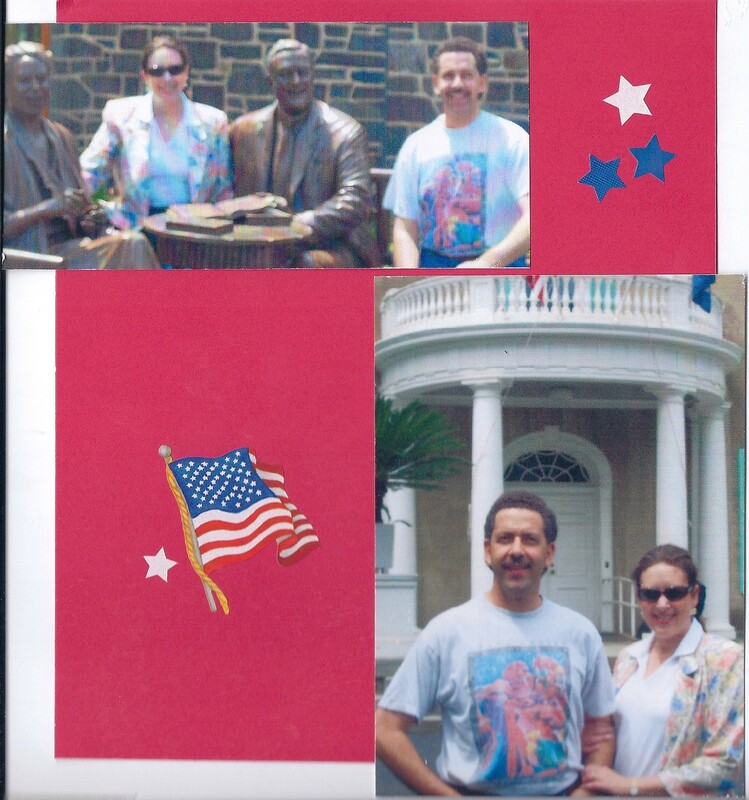 It’s been eight years since I visited Springwood and the FDR properties. In writing this blog I have leaned heavily on Wikipedia to remind me of dates and details. Also helpful were sites associated with Staatsburgh State Historic Site and the Hudson River Valley Institute. Brochures from the National Park Service were useful and the NPS websites are always very informative. I recommend that you follow these links and continue your investigation into this area. What do you think makes presidential homes and libraries such important destinations? Do you think a president’s upbringing influences his presidency or do you thing the presidency is more likely to influence his home?